Fibromyalgia Symptoms Causes and Total HEALING: Recovery IS Possible! First this note/disclaimer: “The information found here has not been approved by the FDA and is not intended to diagnose, treat, cure, or prevent any disease.” I'm only sharing our own story, your situation may be VERY different, and I'm not a medical professional or anywhere close. Use this information only to do more research on your own! I was crying so hard the bed was shaking. So much so that it started to make me sea sick and I had to move to the floor. That was about the time when my husband came home after working his second job. He had to work two jobs to support us because of all the medical bills. Seeing the pain in my husband’s eyes, seeing myself through his eyes, even though I didn’t think it was possible, I felt even worse. Would this nightmare ever end? I was very sick with a diagnosis of fibromyalgia, but also a whole host of other illnesses and symptoms including major depression, anxiety, chronic fatigue, irritable bowel syndrome, post traumatic stress disorder, migraines, infertility with horrible periods, and morbid obesity. I was in constant pain that was barely alleviated by powerful narcotic drugs. I had lost my job, most of my friends, and my relationship with my family was severely stressed. I was sick for nearly twenty years, the last six of them in bed 12-16 hours a day. Often, I was so exhausted I would have to choose between zapping something in the microwave or bathing. There did not seem to be any end in sight. In our modern world we are constantly bombarded with toxins in the air, water, food and even our thoughts, which cause all of the symptoms and health problems I dealt with, and even more in others. In people with fibromyalgia, the body’s detoxification system is overloaded and unable to excrete toxins efficiently. Although other issues come into the mix, such as food intolerances and infections, the root cause is accumulation of toxins. However, healing from fibromyalgia is not as simple as just removing the toxins. I was very fortunate in that my main medical doctor, Hal Blatman, MD, actually encouraged me to seek out and try all different kinds of alternative treatments. I made it my goal to find the answers to recover. I started praying and visualizing on optimal health every day. I was also very fortunate that at that time I was in a financial position to try something new every month. I attended a local lecture titled, “Why Is Everyone So Sick?”, because I wanted to know why I was so sick! There I met the holistic practitioner, Victoria Smith, who eventually helped me to recover. 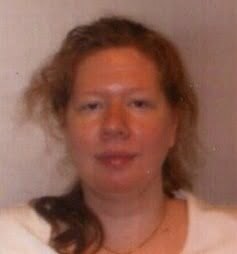 Victoria started me on an easy program of detoxification and gut healing. Within only three weeks I felt so much better I thought I was cured! (I wasn’t, I still had a long way to go, but that’s how much better I felt.) From that point on I was able to start doing all of the other things that led to me becoming 110% recovered: eating traditional food, getting the restorative sleep I need, exercising, and keeping out the toxins. I say 110% because I am so much better off now than before I became sick! Within three months I was completely pain free and within ten months I was able to lose over seventy pounds, get off all nine prescription medications, travel, and even start my own business. 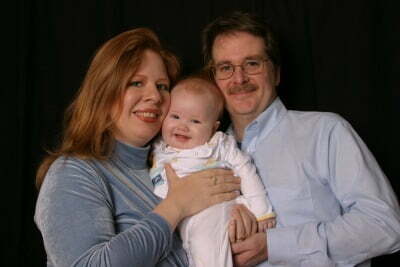 Then I got the biggest news of my life: after eight years of marriage I was surprisingly pregnant! Nine months later I gave birth to my miracle baby. I just love being a mother! 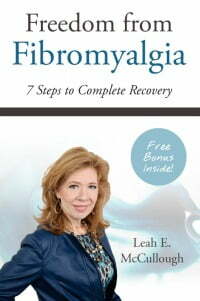 Two years ago I was inspired to write my book Freedom from Fibromyalgia: 7 Steps to Complete Recovery. It was published in April (2014) to five-star reviews on Amazon. I’ve also gone on to lose over 100 pounds and began running. In September of this year I finished the U.S. Air Force Half-Marathon. I went from the sofa to the finish line! For more information or if you would like to know more about how I recovered from fibromyalgia and a host of other chronic conditions, I invite you to join our community at www.TheFibroLady.com. We have a free monthly webinar to interview experts and answer your questions, and a “secret” Facebook group called The Hope Army. Find out about it by signing up for my natural health newsletter, “The Unconventional Traditional.” As a gift for signing up you will receive the eBook: Lose Up to 15 Pounds in 30 Days without Exercising, Starving or Stressing ($29.95 value). I have spent nearly twenty years searching, tens of thousands of dollars, and fifteen years of savings to find and publish answers to the question “How can I regain my health?” It is my hope that my investment pays off for you, too! 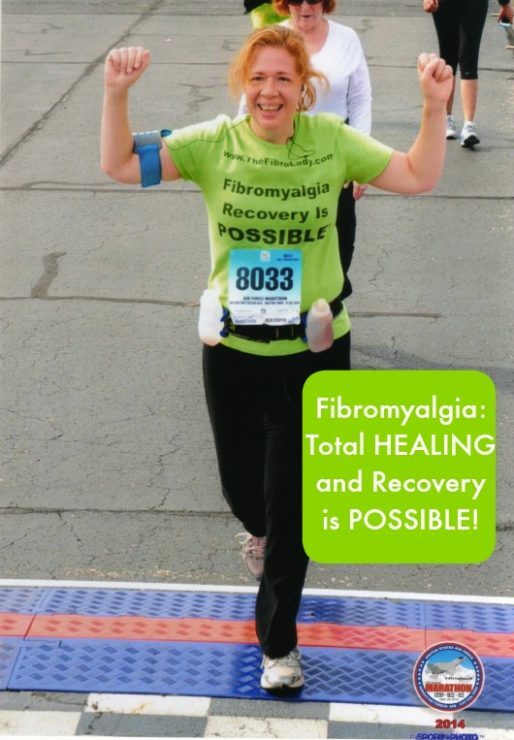 Natural healing expert and speaker Leah E. McCullough, affectionately known as The Fibro Lady, is author of the book Freedom from Fibromyalgia: 7 Steps to Complete Recovery. Receive the eBook: Lose Up to 15 Pounds in 30 Days without Exercising, Starving or Stressing by signing up for her natural health newsletter “The Unconventional Traditional” at www.TheFibroLady.com. Here’s where to buy good probiotics – a must for when you're working on healing. Read more about healthy fats and oils to support your body as it heals. Here’s where you can get fermented cod liver oil and grass fed butter oil – these work together to build your immune system! Find magnesium oil here – most of us are deficient in magnesium. If you don’t have a good local source, get pastured meats here and avoid the toxins in conventional meat. If you’re not making it yourself, find fermented vegetables (carrots and sauerkraut and others) online from a trusted company – you can toss them in the freezer to keep well so you can stock up. How to soak nuts and seeds to make them easier to digest. 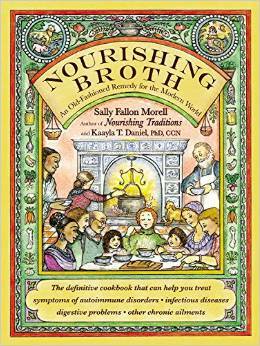 3 ways to make super nutritious, nourishing bone broth or read more here in “the broth bible” about how HEALING homemade bone broth is. Fibromyalgia CURED – Another Real Food Success Story – another story to prove to you that healing is possible! I am very much interested in this book. I cured myself half with the Dr. Lowe method also from a fibro book on the internet, which is a great thing since i was a fibro patient with severe physical en mental problems. I hope this book contains more good ideas on how to improve. Detoxing goes badly for me my detox symptoms are bad, so I assume I have a lot of toxins, did anyone have good results with oil pulling for a start? I need something that doesnt makes me go on a heavy detox right away, but that starts small. Even small bites from chlorella are too much right now. I was diagnosed with fibromyalgia and have been interested in doing a food healing. However, I’m breastfeeding now and probably will for another year. Would it be safe to do Leah’s program? Or should I wait until I’ve weaned my LO? Hi Julie, this is Leah! I had recovered by the time my little one came along but I was still using zeolites for detox and SH FermPlus Pro for a probiotic (gut healing) at a maintenance amount while pregnant and breastfeeding (which we did extended breastfeeding). You have to weigh the costs/benefits for yourself and your family. Hope this helps with your decision and congratulations on becoming a mother! Is there a link for the Facebook group, I typed The Hope Army into the search bar and nothing came up. Thanks!! I have 2 suggestions for you. One is to buy the electronic version of the book, which is available for a discounted price and for immediate download at http://www.TheFibroLady.com. If you want the paperback version, I’m happy to mail you a copy. Please email me directly at [email protected]. I will have to check to see how much postage is. Thank you for your interest! Also, you must be a really good friend to go to such lengths. Blessings to you both! Great story! I truly respect people who have the ambition to take care of their bodies and the knowledge to realize that health can only come from good food that we eat and by having healthy thoughts. Way to go and keep up the great work and keeping spreading the great news to as many people as possible! I love this!!! My journey took much longer, but I was doing everything the hard way. Hindsight is funny…I wish I would have known what you do. My story is the one in the link mentioned at the beginning. I have a lot of love for those who pray for inspiration and dig deep and find that inner strength to be lifted up! I remember reading your story a few months back and that is what inspired me to approach Kelly at the WAPF Conference. Isn’t it funny how these things work! Thank you for your courage to share your story. Kelly, thank you for providing a platform of help for people. We are all so much better off from the work you do!!! I’ve suffered from this debilitating illness for 13 years and can say the exact same things Leah says about it and the state I am in. I’ve tried just about everything that western and eastern medicine has to offer. Although her information is not new to me, I have never been able to “do” the things she talks about. I wish I could have someone buy and prepare all the food/supplements…I would truly commit. But with my pain and very limited energy, it’s all I can do to just work part time and care for my family. To research, buy, plan and prepare this food, on top of what I already need to do during the day, well, it seems like Mount Everest to me. There’s no way I can climb that mountain! Praying I can!!! The desire is there but the reality of doing it is so hard! Thanks for posting Leah’s story!! Liz, maybe you could start by getting on Leah’s Facebook group mentioned above for support, and they could help you find small ways to start out, and then as you feel a little better you could do more, and it could snowball into healing! Detoxification and gut healing can actually be simple, fast, easy and very, very effective. It greatly depends on the products used. I used SH Zeolites for detox and for gut healing SH Ferm Plus Pro, both available at http://www.RipplesHealthShop.com (they come with instructions on how to use them together). This is how I made The Healing Quantum Leap (Out of Bed). Most people that are in a fatigued state cannot be expected to do much more than just survive. I wrote my book with this in mind. I have plans on how to recover when you are at different stages of healing, even if you are in bed most of the time like I was. Feel free to join the Facebook group, or even PM me. I’ll be happy to help you in any way I can! Thank you all for your wonderful advice!! I’m taking it! I’ve spent a small fortune on things that have not helped, but Leah, your recovery is very inspiring and convincing. I’m ordering your book today and joining the group. I’m a PA in a very busy medical practice (part-time) and would love to be able to bring this recovery to my patients…after walking it out first myself! My husband is incredibly supportive which will also help tremendously! One more question- Leah, did you use any of these products during your pregnancy and did you breast feed with them? I am expecting my first biological child in 2 months (we have an adopted son). And I do want to breast feed. Kelly, this is also an interesting topic you can maybe blog about at some point, but did you see the recent M.I.T. Study they did on GMOs and autism? They compared American women’s breast milk to European women (where they aren’t GMO foods) and the results were astounding when it came to autism in children. It actually made me think of you when I read it!! I did extended breastfeeding too! At 5 my son still remembers nursing. It is so sweet! I don’t know how I would have gotten through the toddler years without it! Darn, Leah your book is unavailable on amazon (but that’s probably a great thing!). Can I order one somewhere else or through you directly? The book has been restocked and now available on Amazon. Thanks everyone! I have a spouse who has been diagnosed with fibromyalgia for over 9 years. I fully understand the hopelessness of her feelings and how frustrating for a care giver to be able to do nothing to help the problem. I will certainly tell her about this article and hope that it will instill some hope for recovery within her. Thanks for putting this out there. I’ll say a prayer that she is healed too! !